I am so excited for this week’s Facebook live!! Last week did not go as planned and I had technical issues. I’m happy to report I have them all figured out (fingers crossed) and this week should go as planned!! I love the project I designed to share with you all this week. 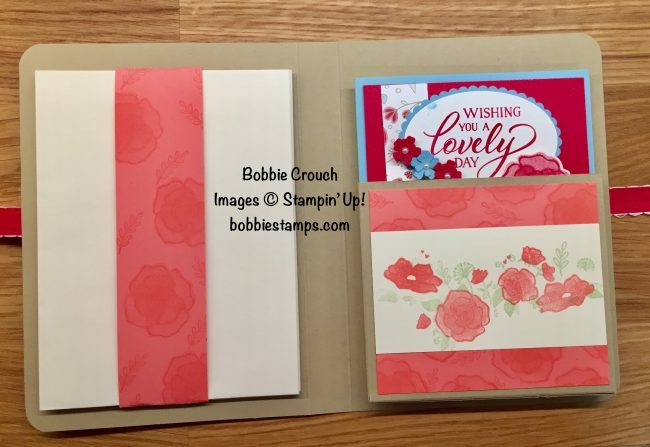 I make a lot of cards and I was thinking of ideas where I could make a cute little box to gift them in. This is what I came up!! I LOVE it so, so much!! I’ll show you how you can make your own. It takes no time at all and looks beautiful when you are finished. Make sure you visit my Facebook page, leave a comment and share the video and you will be entered in this weeks prize patrol. I’ll announce the winner on my next Facebook live on January 30th. 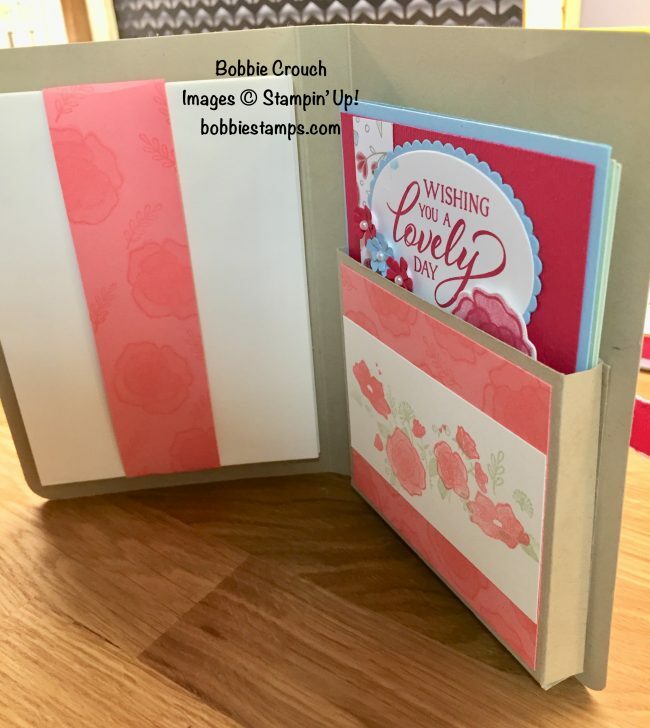 I will also be giving away the card holder I make today at the end of the Facebook live broadcast. I’m even including a few cards and envelopes. We had a very bad ice storm here last night so my drive home took me a bit longer than normal. I did not have time to write up the supply list and tutorial. I’ll post it as soon as I can!!! hopefully, I’ll have it done by Wednesday night. Today I had to cancel my Facebook live due to illness. 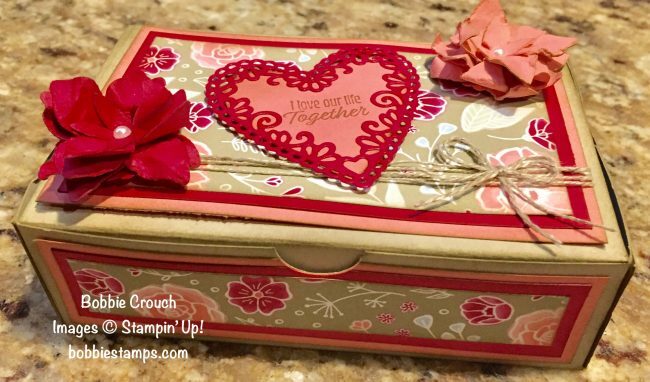 I was going to demonstrate how to make this adorable treat box. I will try my best to do a video and post it to YouTube to show you how I made it. I will also post the supply list later tonight. As soon as I saw the Rectangle Stitched Framelits Dies I knew I wanted to make a treat holder using the dies. You can purchase them in a bundle and save 10%. 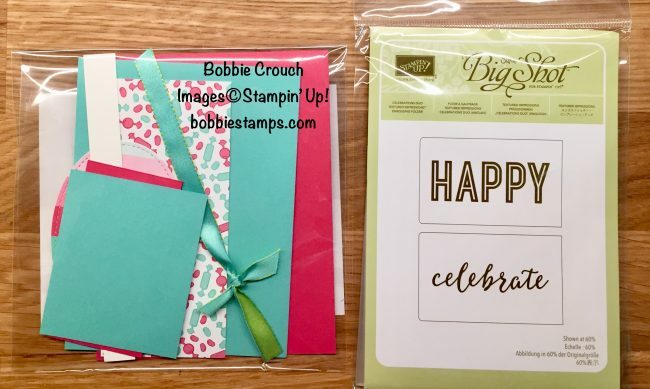 They are bundled with the Amazing Life stamp set on page 28 of the new Occasions catalog. 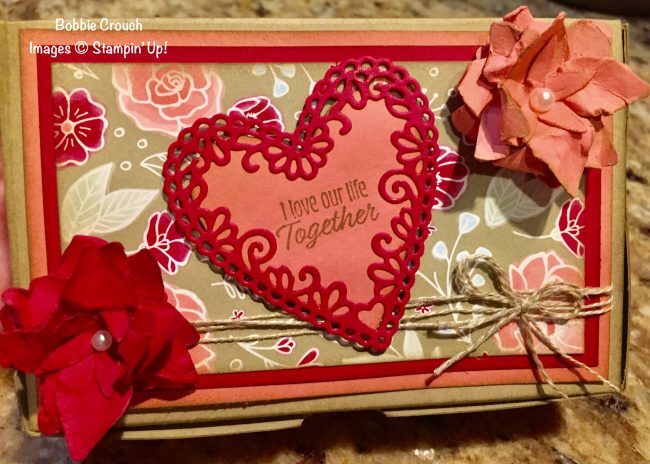 I used the Meant To Be stamp set to make the hearts and decorate the front of the box. I love this stamp set so much. I am offering it as a class to go if you want more information just click the “Online Classes” tab on the menu above for all the details. 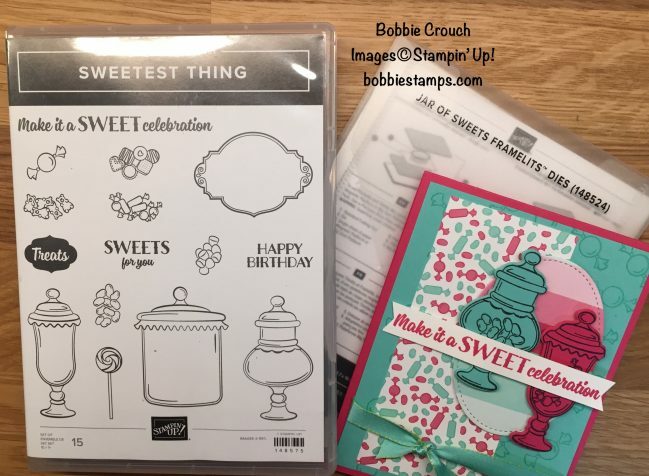 These are a few of my favorite items from our new Occasions catalog. 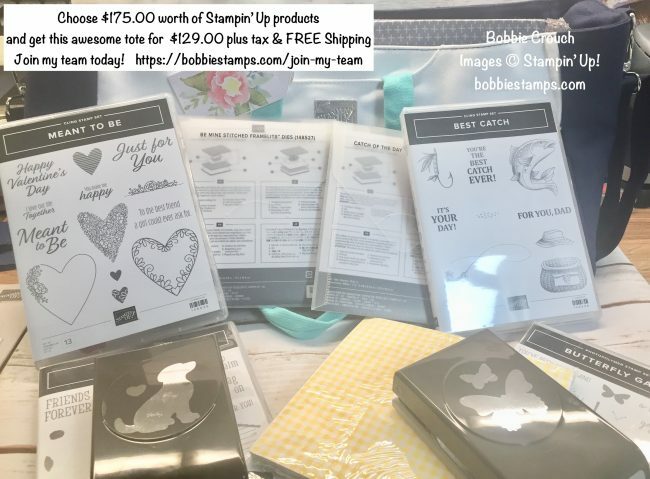 This is just one of many combinations you can choose when you join my team during Sale A Bration and choose the items you want in your starter kit! Choose $175 in product and only pay $99 plus tax, free shipping or pay $129 and get the awesome tote bag. All your future orders placed of $50 or more will earn a free Sale A Bration gifts that you choose! You also will enjoy a $20% discount for the next 7 months!!! You could earn as much as 25%!! I Hope you consider purchasing the starter kit and joining my team, Inked Inspiration! 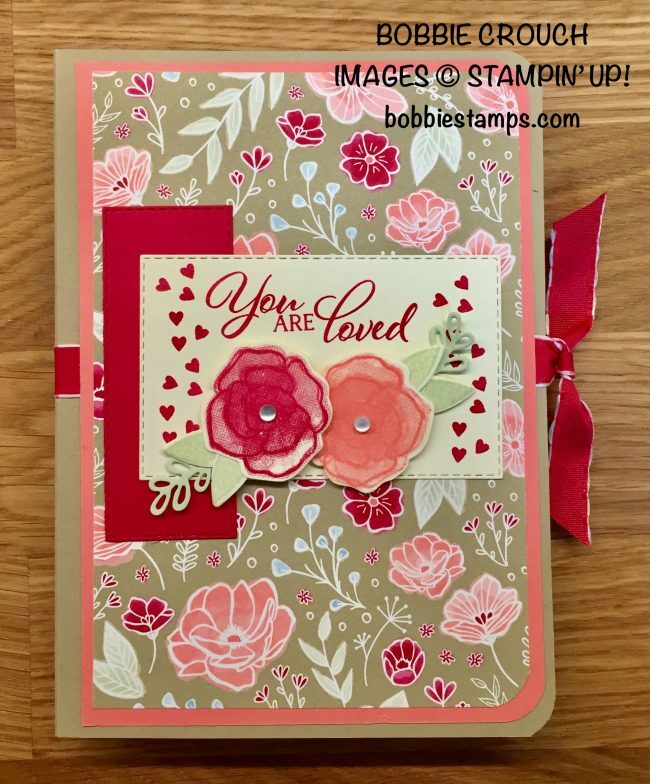 You’ll love our little group of stampers!! What are you waiting for??? this deal only comes around once a year!! What do you have to lose except saving yourself some cash on all your orders!! You also will receive all my online class videos FREE just for being on my team! Hi Friends, I hope you can join me for my Facebook live today. If you can’t watch during the live broadcast make sure you watch the replay. 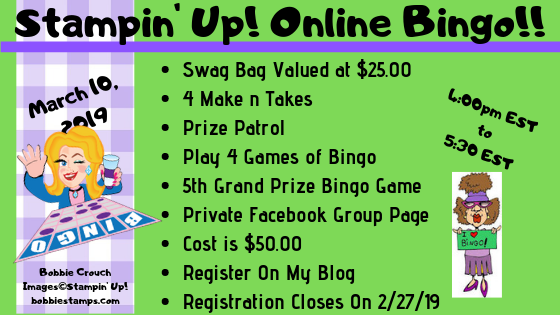 You can still comment or share the broadcast to be entered in the prize patrol giveaway. I am so excited about today’s project. 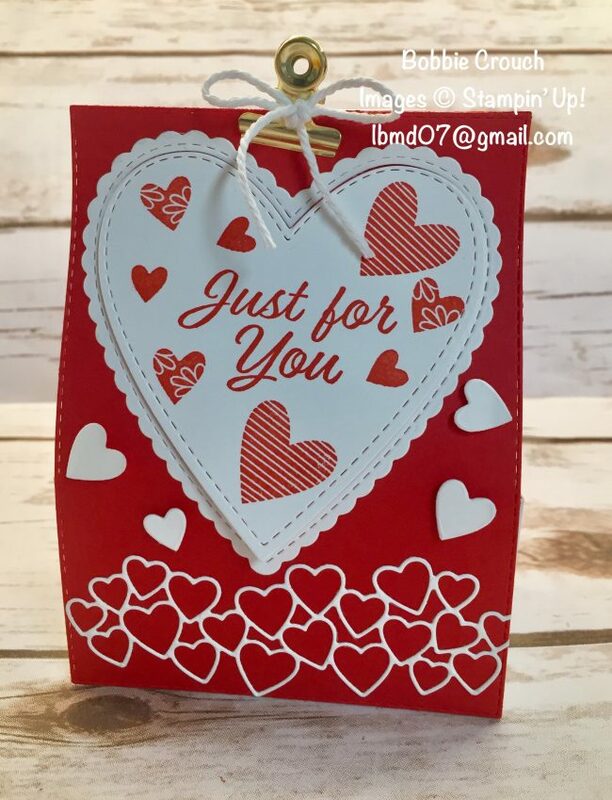 I love making 3-D projects, boxes, bags, treat holders etc. I also love distressing my projects and this one is distressed to the max!!! 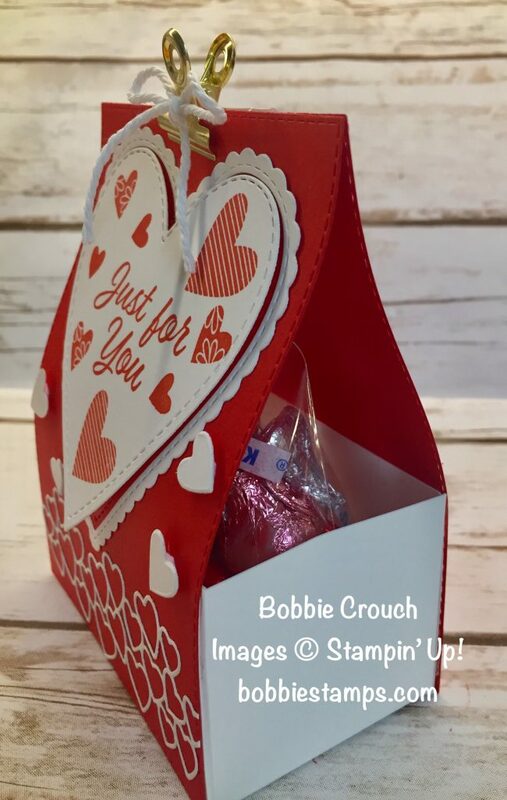 This is a cute box you can use for Valentines Day treats, or change up the design and use it for any occasion. 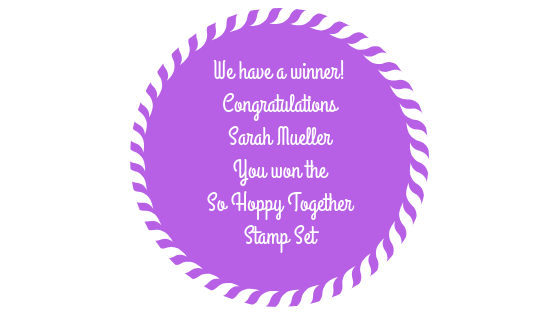 This weeks Prize Patrol giveaway is this cute & fun stamp set! You can click on the “Supply List” link to download the FREE PDF for this project. It’s located under the supply list image! Here is the hostess code for January and the FREE Make N Take Packets. 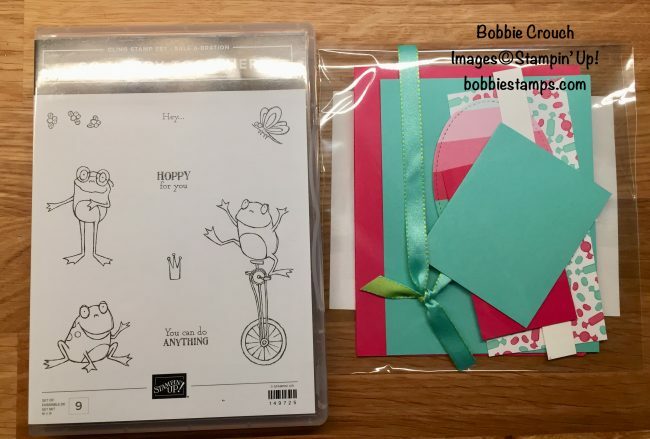 I will be posting the 3rd make n take packet later today. If you want to know how you can earn yours just click on the menu above titles FREE Card Packets. I hope you enjoy these! 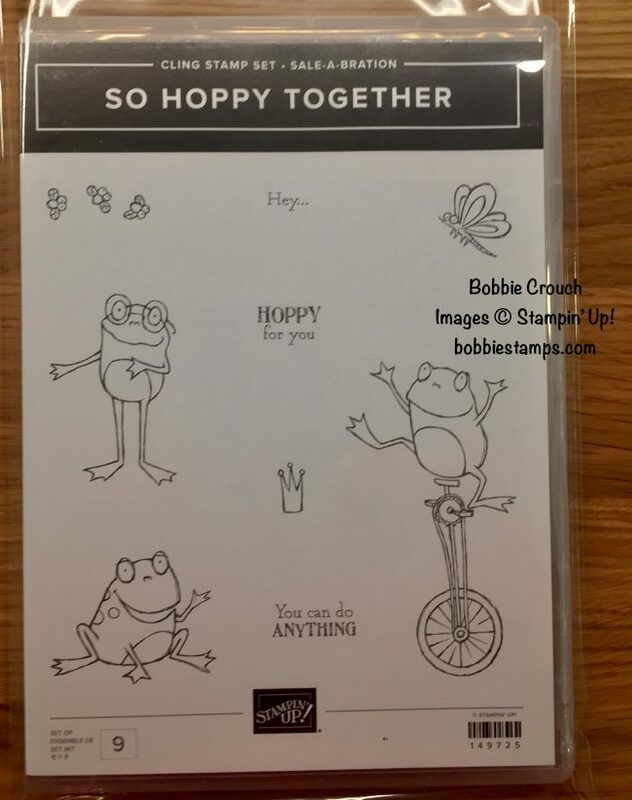 Make N Take #1 is this super cute 2019 calendar. 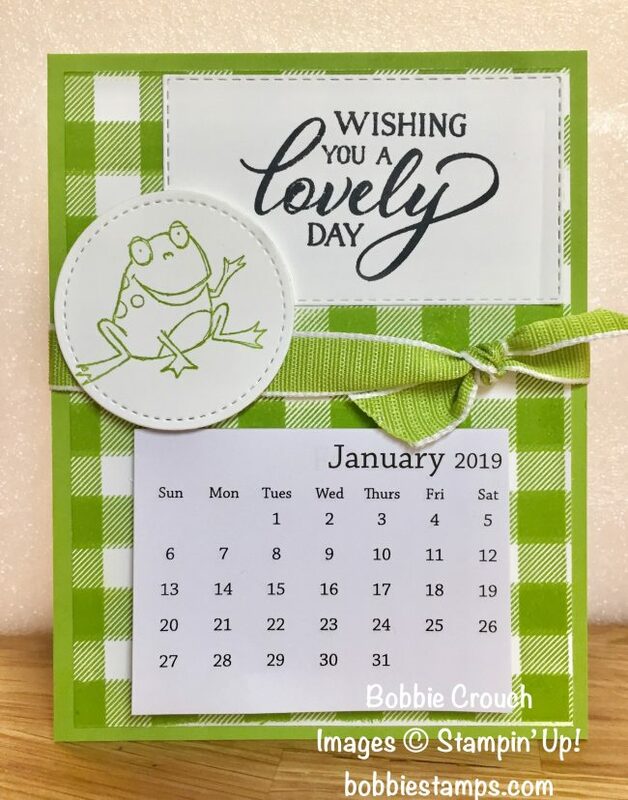 I am even sending you the little calendar! How cute is that frog? 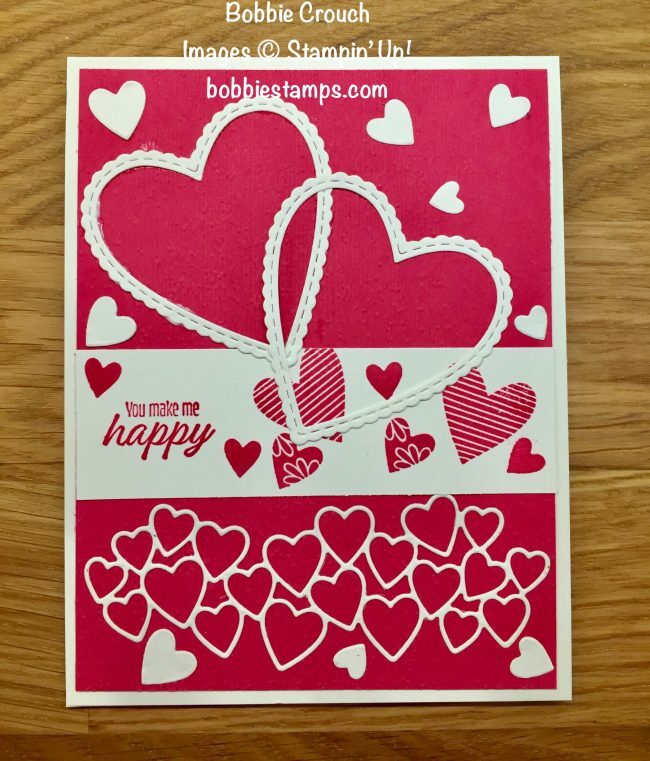 Make N Take #2 Super cute card with hearts galore! MAKE N TAKE #3 WILL BE POSTED LATER TODAY! Happy New Year!!! 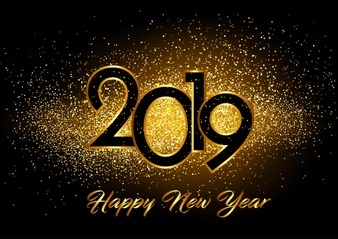 I am so excited for 2019 and to see what it has in store for all of us. As you all know 2018 was not a great year for me. I am hoping 2019 will be the year I earn my very first incentive trip. The incentive trip we are working on is Maui and will take place in 2020. 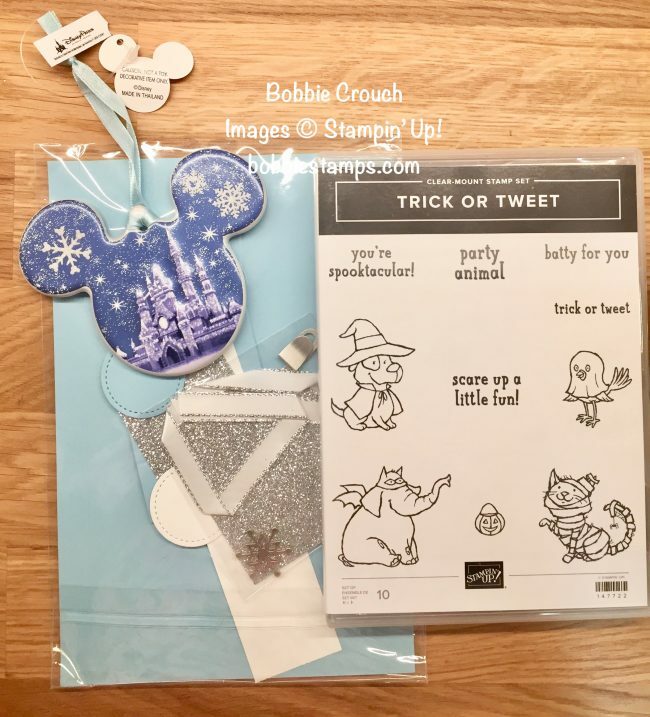 This is the most exciting time of year to shop Stampin’ Up! on January 3rd our Occasions catalog goes live and our customers can start ordering from it. For every $50.00 you spend in the Occasions or Annual catalog you earn a free Sale-A-Bration product!!! If you need a catalog please let me know.